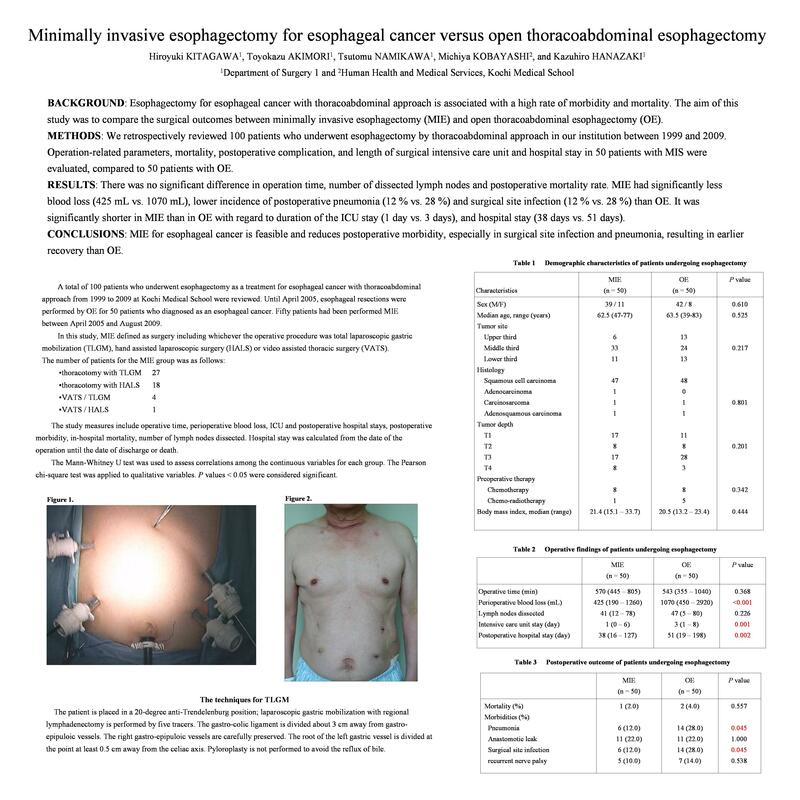 INTRODUCTION: Esophagectomy for esophageal cancer with thoracoabdominal approach is associated with a high rate of morbidity and mortality. Minimally invasive esophagectomy (MIE) using laparoscopic or thoracoscopic surgery has been proposed to decrease these complications. This retrospective study aimed to compare the surgical outcomes between MIE (group A) and conventional open thoracoabdominal approach (group B). METHODS: The study enrolled 100 patients who underwent thoracoabdominal esophagectomy for esophageal cancer in our institution between June 1999 and August 2009. MIE surgery had started since April 2005, which including total laparoscopic gastric mobilization or hand assisted laparoscopic gastric mobilization with thoracotomy or video assisted thoracic surgery. The number of patients was 50 in group A and 50 in group B. There was no difference in preoperative characteristics between two groups. Operation outcomes and postoperative complications were analyzed retrospectively. RESULTS: There was no difference in operation time (A: 578 ± 80, B: 558 ± 128 min: p=0.62) and number of dissected lymph nodes (A: 42 ± 15, B: 46 ± 16: p=0.58). Group A had significantly less blood loss than group B (A: 502 ± 250, B: 1187 ± 537mL: p<0.01). Postoperative mortality rate was 2% in group A and 4% in group B. Postoperative pneumonia (14% versus 28%; p=0.05) and surgical site infection (14% versus 28%; p=0.05) were higher in group B. Duration of the mean postoperative intubation time (A: 1.3 ± 1.1, B: 2.8 ± 1.5 day, p<0.01) and intensive care unit stay (A: 1.5 ± 1.2, B: 3.8 ± 2.0 day, p<0.01), start walking (A: 2.8 ±1.8, B: 6.5 ± 2.8 day, p<0.01), hospital stay (A: 44.3 ± 26.8, B: 62.5 ± 36.7 day, p<0.01) of group A were significantly shorter than group B. CONCLUSIONS: Minimally invasive surgery using laparoscopic or thoracoscopic surgery for esophageal cancer is feasible and better than conventional open approach in early recovery and surgical outcomes.